Every team in the NHL has defensemen that also excel in the offensive zone. Think Brent Burns, PK Subban, and Erik Karlsson for starters. While having a strong shot and good hockey sense are fundamental ingredients to being an offensive defensemen, there are also simple tricks that will help you create more scoring chances. 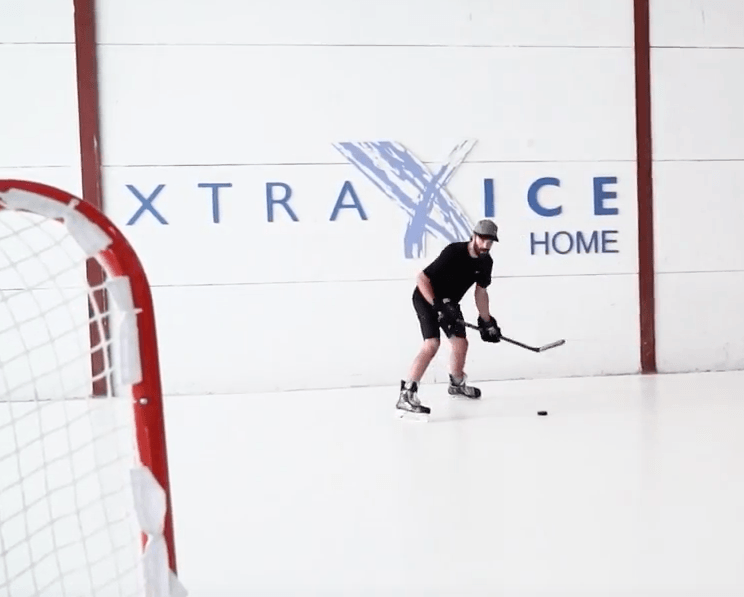 In this post, we’ve created some simple but highly effective drills on Xtraice Home synthetic ice that will help you practice these skills while also working on your footwork and shooting. Here we’re simulating receiving a pass on the boards in the offensive zone. Take a couple of quick strides to the middle, and get a shot on net. Getting to the middle improves your shooting angle, creates higher quality rebounds and gives you more passing options. It doesn’t need to the hardest shot but it needs to hit the net. Practice low shots to create rebounds and vary between slapshots, half slappers, and quick wristers. Brent Burns is particularly adept at using different types of shots to get pucks through traffic and on net. Here you’ll pinch in, retrieve the puck and then back peddle to the blueline, dragging the puck to the middle and getting a quick shot on net. Try varying the type of shot and make sure you hit the net. In this drill we’ll use a stick as a defender. Fake a shot to freeze the defender and then take a step around the stick to get a quick shot off using the shooting lane that you’ve just created. You can alternate stepping forward or backwards. Brent Burns uses this technique every game to get pucks through traffic. The release after the fake should be quick. If you take too long, the shooting lane will close. –>To intensify the drill, add a pass at the beginning. You want to shoot with traffic in front and make sure your shot doesn’t get blocked. Fakes help you trick defenders, buy yourself time and open up shooting lanes. Shooting lanes close quickly so you need to get the shot off fast. Even if it’s not your best shot, it can still create a scoring chance in the form of a rebound, a deflection or through a screen. Get creative and imagine game situations. Work on keeping your head up and selling your fakes. These drills should form part of your regular workouts and even forwards can benefit greatly from fundamentals in each exercise.